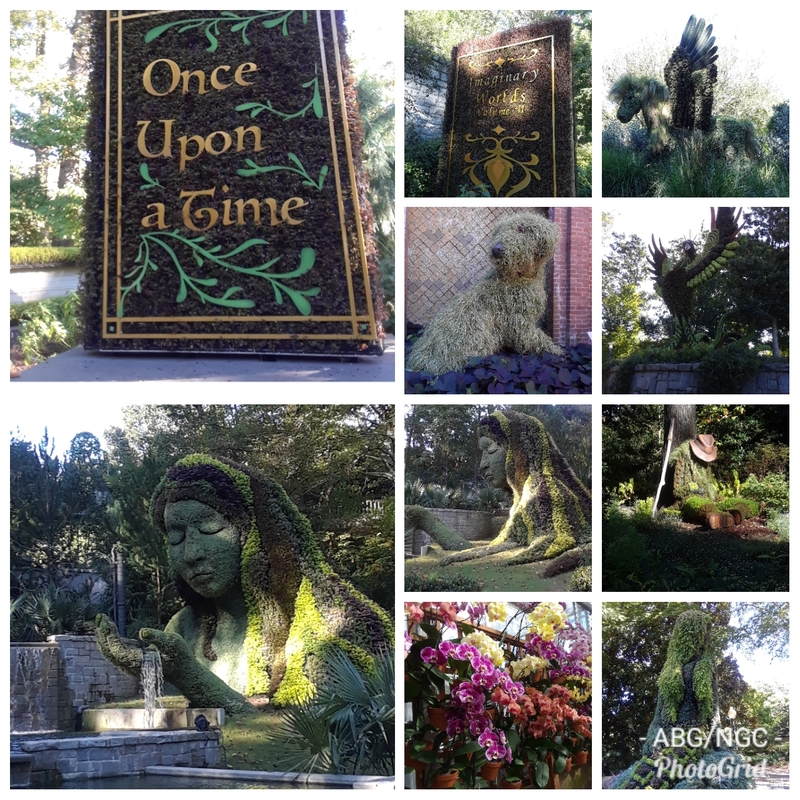 The Norcross Garden Club attended the ABG on September 15, 2018 for a docent tour of the spectacular story-book themed exhibition, Imaginary Worlds: Once Upon a Time. The exhibition was created by International Mosaiculture of Montreal. Mosaicultureis the horticultural art of creating giant topiary-like sculptures using thousands of annual bedding plants to carpet steel armature forms. Mosaïcultures Internationales® is an internationally protected name and patent. In fact, the Atlanta Botanical Garden is the first and only American botanical garden to have their mosaics on display. The original exhibition was from 2013-2014 and three permanent mosaics remain from that show: Earth Goddess, Frogs and Shaggy Dog. Docent Cyndy Franklin tells us that all the docents fell in love with the Shaggy Dog `structure and raised the $18,000 needed to purchase the little fella. They were all pleasantly surprised when Mosaiculture of Montreal decided to donate it to them in honor of their hard work and dedication to the show! 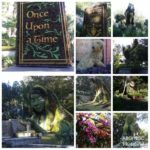 Cyndy further shares that there is a full-staff hired especially for the care and maintenance of these breathtaking sculptures. If you get to the gardens early enough you can see the staff trimming each sculpture with tools as small as nail clippers. They call the individual plantings they use to create the mosaiculture “plugs”. They even created their own custom garden tool to the exact size of the plugs. The plugs are replaced frequently as the season progresses to keep the sculptures looking their best. Some of the mosaics have drip systems but there are several that must be hand watered by the dedicated ABG staff. In fact, as many as 5 people have the sole jobs of keeping these sculptures hydrated in our Georgia heat. In the original show the topiaries were made entirely in Montreal and installed here in Atlanta but as we know the climate is very different in these two places. Learning a lot from the first installation this time around they opted to grow all the plants in a large greenhouse in Buford, GA. Careful selection was made to use plants that were hardy and had a variety of colors. Succulents were among this final selection of plantings. As a docent Cyndy was able to see the behind the scenes look at these mosaics in their growing state. The new process involves the creation of the steel structures in Montreal, the structures are then shipped to Atlanta where they are covered with mesh then filled with soil and sphagnum moss. As stated earlier all the plants are grown in a local greenhouse then trucked to the gardens and assembled in their display space. Cyndy said it was a delight to see these creatures erected. Every detail is created with plantings even the shadowing which is achieved using darker plants. The features that are not plants are made from resin such as the tusk on the handsome Woolly Mammoth. The garden coordinates the surrounding plants with each structure and I can attest that everything looks perfectly placed. The prancing peacock in the Fuqua Orchid Center looks utterly at home among the lush surroundings. Here’s a bonus from Cyndy and my vote for the next NGC field trip to Rainbeau Orchids in Milton, GA, www.rainbeauorchids.com. She informed us that most of our local grocery stores buy their orchids from Rainbeau and they are open to the public on Saturdays and Sundays. Our skilled docent perfectly planned our visit to take advantage of all the shady spots in the garden which was much appreciated on the sunny 90-degree day. Cyndy even timed it so that we can see the frog feeding. We all received a delightful education about frog eating and mating habits. A tip for all of us this fall is to keep some of your fall leaves in a pile in your yard. Many animals need these spaces especially frogs to survive in the colder weather. The heat from the decaying leaves provide warmth and a place to lay eggs for native frogs. One of the biggest lessons we all learned on this trip was about ABGs conservation commitment. They are leaders in South American frog preservation housing and mating several endangered species with hopes to release them back to their natural habitats. So when you support the ABG through visits, membership or donations you should be pleased to know that they are helping conserve both plants and wildlife around the world.